Read for my go-to recommendations to help you feed your baby with confidence, and avoid wasting time searching on Google, especially since it may lead you to bad advice. The hardest time I’ve had so far as a parent (I’m sure there are more difficult times to come!) was when my oldest son was a baby. You guys, no matter how many books I read, I just felt like I had NO CLUE what I was doing as a mom. There is so much to know! Are these loud breathing noises normal? How do I unfold the stroller? How often should he nap? The questions go on, and on, and on. So I was grateful that with baby #2, I had already been through babyhood with my son, and I felt a little more confident in my mom skills. When it comes time to feed your baby, there are so many questions! What should I feed them? How much? How often? What if I want to try baby-led weaning? How do I do that? What is that? Maybe it’s just that I’m a questioner by nature, but I don’t think I’m the only one that feels like I need more information before diving into new territory with my kids. As a dietitian, feeding my kids is luckily something I have a ton of background knowledge in. But most parents don’t have that background. When I look on Pinterest or Google for nutrition information, I see a lot of incorrect info and bad advice! There are lots of qualified professionals putting information out there, but there is just as much, or more, bad information. And I feel like the bad info is always easier to find….why??? It makes me sad and frustrated. I just want parents to have the right resources so they can feed their babies safely, and healthfully. That’s why I always recommend to parents to seek out professional advice for a topic that is new to them. When feeding your baby, that could mean a session with an RD, but it could also just mean spending some money on a book or an online course like this one. 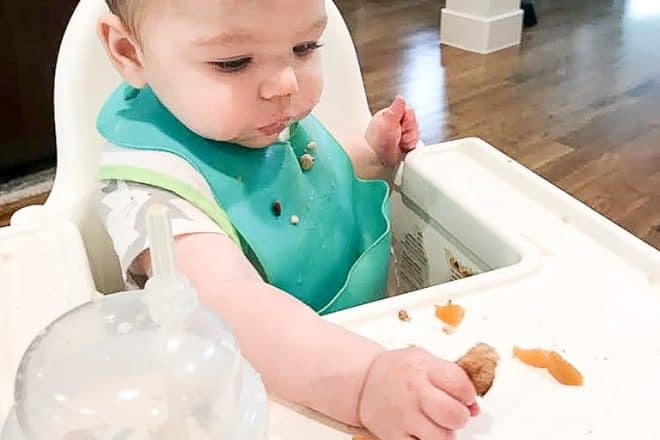 The Parents’ Guide to Baby-Led Weaning: With 125 Recipes by Jennifer House, Registered Dietitian is a resource I recommend parents buy if they are thinking about trying baby-led weaning. Yes, you can find websites that talk about baby-led weaning. But don’t you want advice from an expert that is backed by research and used in practice by nutrition/feeding professionals?? Your baby is worth it! I love Jennifer’s book because she provides everything you need to know to feed your baby. She covers the how, the why, and even includes 125 recipes! We love the Lentil Patties on page 108. They freeze really well and save me when I’m short on time, or am eating something I can’t share with the baby (like a salad). I personally read the book cover to cover right before my 2nd baby was about to start solids. But even if you’re not a nutrition nerd, you can skim through and get the information you need to get started. The online course I mentioned is by Feeding Littles, an RD and OT/Feeding Therapist expert duo. It’s called Infant Feeding: the Baby-led Way, and is perfect for parents who rather watch a video than read a book. You can even watch it from your phone! It shows you exactly how baby-led feeding is done. (Through July 31, 2018, get $10 off with code MAMAKNOWSNUTRITION) And if you’re in the mood for a good cry, read this heartbreaking story about Jack, who inspired the creation of Feeding Littles. The key here is that in reading a book like Jennifer’s, or taking a course like Feeding Littles’, you gain the confidence that you’re approaching things the right way for your baby. Questions will pop up along the way. You will have a resource that you can trust to go back to and find answers. So much of parenting is just making things up as you go along…but you don’t always have to struggle your way through the tough parts. It is so worth it to get a little help so you have the confidence that you’re doing the right thing! Paleo Baby Food Pouches: Should You Buy Them? *notes: I received a free copy of The Parents’ Guide To Baby-Led Weaning, but would have recommended it anyway. There is a temporary affiliate code for the course by Feeding Littles.